In the 1980s, NASA's Voyager program spotted a bizarre feature in the clouds swirling around Saturn's north pole: a hexagonal vortex. That vortex is shown here in striking detail based on data from the international Cassini mission that were gathered in late 2016. 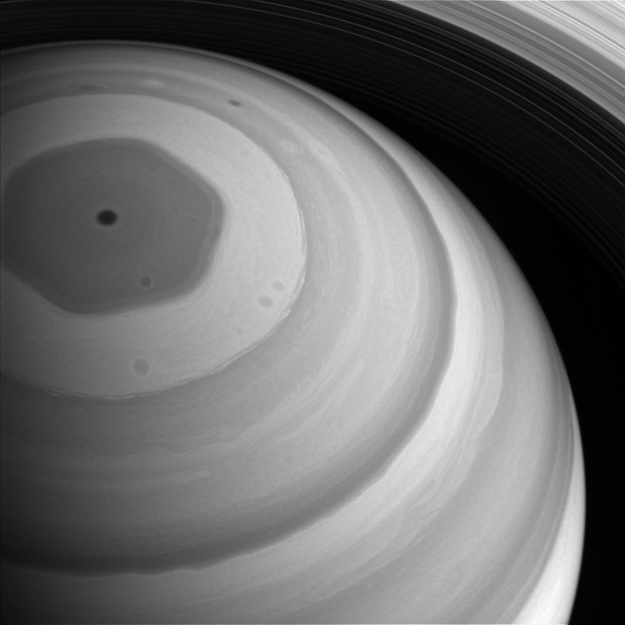 A new study based on observations by Cassini's Composite Infrared Spectrometer (CIRS) has discovered that this vortex may strongly influence the layers of atmosphere sitting above it, and that it might actually extend for hundreds of kilometres in height. By exploring the upper layers of Saturn's atmosphere in this region, the stratosphere, scientists have used Cassini data spanning 2013 to 2017 to discover a similar vortex located in Saturn's northern polar stratosphere. This view looks towards the sunlit side of Saturn's rings, showcasing the planet's distinctive, enigmatic body and ring system, and was obtained at a distance of approximately 1.2 million km from Saturn. The image scale is 74 km per pixel.